For the last two weeks, I have written about carbohydrates and fats. This week in my Health & Fitness column in the Aiken Standard I am covering protein, another essential macronutrient in your diet. Protein is part of all cells and is the main component of muscles. Proteins are made up of building blocks called amino acids. The human body requires 20 amino acids for the synthesis of its proteins. Your body can produce some of these amino acids, so they are called non-essential because you do not need to get them from your diet. There are nine essential amino acids that cannot be made by the body and are obtained only from food. If the protein in a food supplies enough of the essential amino acids, it is called a complete protein. An incomplete protein is one that does not supply all the essential amino acids. All meat and other animal products are sources of complete proteins. These include beef, lamb, pork, poultry, fish, shellfish, eggs, milk, and milk products. Protein in plant foods (such as grains, legumes, nuts, fruits, and vegetables) are either low in or lack one or more of the essential amino acids. These food sources are considered incomplete proteins. One exception is soy protein, which contains all of the essential amino acids. Plant proteins can be combined to form a complete protein. This is called complementing. Examples of complementing plant proteins are food combinations such as rice with beans or black-eyed peas, beans with corn or wheat tortillas, and hummus, which combines chick peas with sesame paste. Since plant sources of protein are lower in fat and higher in fiber than meat, there are health benefits from getting more protein from plants. 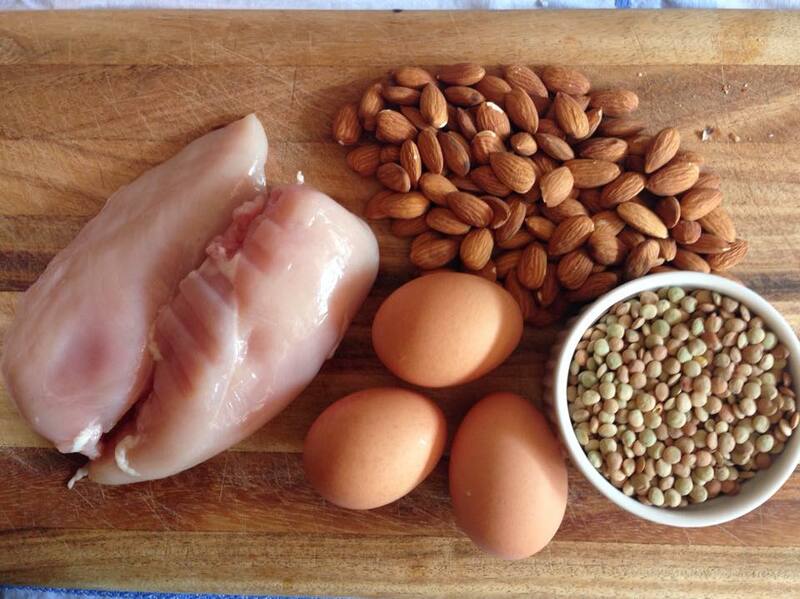 A diet low in protein could lead to poor growth in children or result in muscle loss. For this reason, many people, especially athletes, are concerned about their protein intake. The typical diet for most people contains more than enough protein, so this concern is often unwarranted. People who follow vegetarian or vegan diets do need to pay extra attention to their protein intake. This is especially true for vegetarian athletes. The amount of recommended daily protein depends on age, medical conditions, and activity level. The recommended intake for protein is 0.8 g protein per kg of body weight (or about 0.4 g protein per pound), so a 200 lb. person would require about 80 g protein per day. In general, two to three servings of protein-rich food will meet the daily needs of most adults. For example, four ounces of meat contains about 40 g protein, one cup of cooked beans contains about 15 g protein, and two slices of whole wheat bread have about 6 g protein. Protein needs are higher for children, pregnant women, and athletes. That said, the average American’s protein intake is sufficient for most of these special situations. While athletes who are training to add muscle require much more protein than the typical adult, the average intake of most athletes is sufficient to meet these needs. In cases when it is not, the recommendation is to get extra protein from food, not supplements. Since you probably get enough protein in your diet already, you should focus on healthier sources of protein. Select lean meat, poultry without skin, fish, lentils, and legumes often. Also try adding soy protein to your diet by eating tofu, soy milk, and soy beans (edamame) since soy protein contains beneficial compounds called phytochemicals. As always, you should get your protein by eating naturally protein-rich foods rather than through supplements or processed foods with added protein. This entry was posted in Health & Fitness and tagged amino acids, complete protein, dairy, healthy eating, legumes, meat, nutrition, protein. Bookmark the permalink.